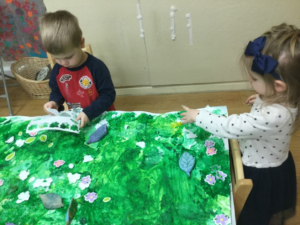 Every Day is Earth Day at The International Preschools! Creating a collaborative spring project using paint and collage materials. The green and blue colors represent the land and water of the Earth respectively. Earth Day is celebrated on April 22nd every year, but at The International Preschools, we believe that Earth Day is every day! Although a special curriculum focus is placed upon taking care of the Earth throughout the month of April, the skills learned by the children are meant to be used every day of the year. 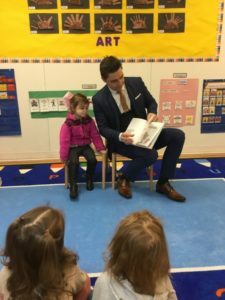 Topics such as plant and animal life cycles, recycling, gardening, and keeping the Earth clean are touched upon inside of our classrooms during this time. Continue reading to learn more about the concepts that IPS students are exploring throughout the spring months! Green 1 students say hello to their visitors on Grandparents and Special Friends Day last year. 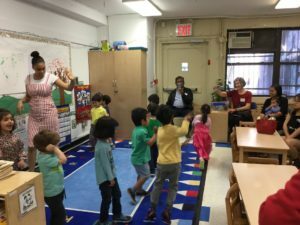 Throughout the year, The International Preschools hosts events for families and friends to come together and not only learn about our school, but to celebrate its supportive community. Our Grandparents and Special Friends Day is an annual event where extended members of our students’ families and/or close friends are invited to spend some time inside of the classrooms. This year, Grandparents and Special Friends Day will take place on Thursday, May 9th and Friday, May 10th. 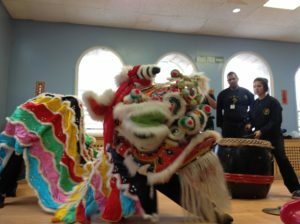 Read on to find out more about this special fete! The Early Bird Catches The Worm: Welcoming Chicks at IPS! Quiver Farms visited our 86th Street location to teach the students about the life cycle of chicks. 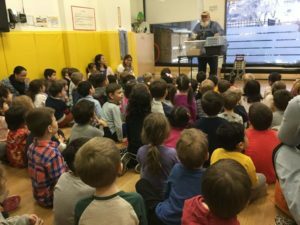 In hopes of ushering in an early spring, the students at The International Preschools spent some time in February learning about the life cycle of chicks. Each location welcomed farmers from Quiver Farms, located in Pennsburg, Pennsylvania. The farmers introduced the children to a hen and a rooster, and spoke about the process of how chicks grow and ultimately hatch from eggs. 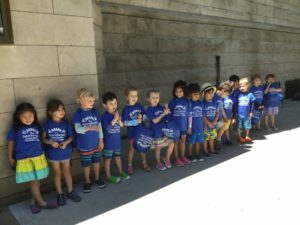 Read on to view photos of the chicks’ time at IPS, as well as to learn about how each location prepared for the chicks’ arrival! 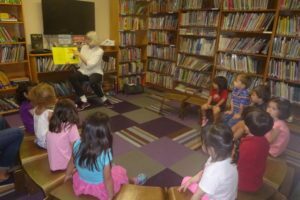 IPS librarian MacKerrow Talcott teaches a class at our 76th Street location. In 2014, the Elizabeth Patrick Leadership Award was established at The International Preschools. Named in honor of IPS Board of Trustees member Elizabeth Patrick, the award was created to honor a faculty member who has demonstrated leadership via initiative and creativity to the classroom and the school community. The award is given each year to a head, associate, assistant, or specialty teacher. Read on to find out more about the 2018 winner, MacKerrow Talcott, who received the honor in June. 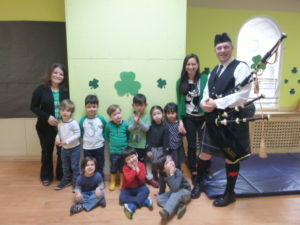 Ms. Christina (10 years) and Ms. Dalia (5 years) with their Green 2 class in March 2015. 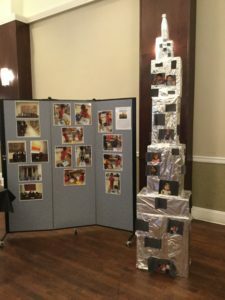 An annual tradition at The International Preschools is to honor those members of the staff who have spent a significant amount of years as employees of our school. Faculty, administration, and staff members who have completed five, ten, fifteen, twenty, twenty-five, and thirty years (and beyond!) as part of the IPS community are celebrated each year at the Annual Benefit. This year, the IPS milestone recipients will receive special recognition at the Annual Benefit, taking place at the Yale Club on Friday, February 1st. They will also attend a luncheon later in February in their honor. Continue reading to find out who will be honored this year! 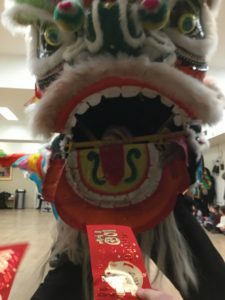 Pre-Party: A view of the 2017 Annual Benefit decor, which celebrated Chinese culture. 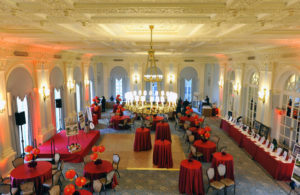 Every year, The International Preschools hosts its annual benefit, which will take place this year on Friday, February 1st, 2019, at the Yale Club in New York City. 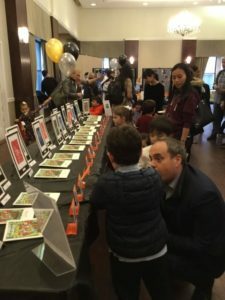 Here, parents, teachers, and staff come together to celebrate our wonderful school with food, drinks, socializing, and music, as well as both a silent and live auction to raise money for our school. To honor the many cultures represented by IPS families, the Annual Benefit’s theme each year centers around a particular country, including its food, music, and traditions; this year, the Annual Benefit’s country theme is France!